You: Boss, patiently waiting to see my quarterly report presentation. Me: Employee, frantically trying to present my desktop while trying to figure out if the audio jitter is on my end. We’ve all been there. Whether you’re presenting or viewing, it’s a frustrating experience. As our workforce become more geographically spread out – people working from different offices, employees working from home, Vice Presidents working almost exclusively from Starbucks (we think they’re charging him rent at this point) – our reliance on remote communication increases. So, how can you provide your workforce with the flexibility to operate from anywhere without compromising collaboration? Well, like most things in life, there are no guarantees when it comes to web conferencing. There are too many variables at play for an organization to control the end-to-end experience. How can you account for poor wireless at Starbucks or a bad cell reception area? However, there are some steps that organizations can take to improve the end user experience. Coupled with proper guidance for your employees, you can avoid the “Missed Connection” scenario. 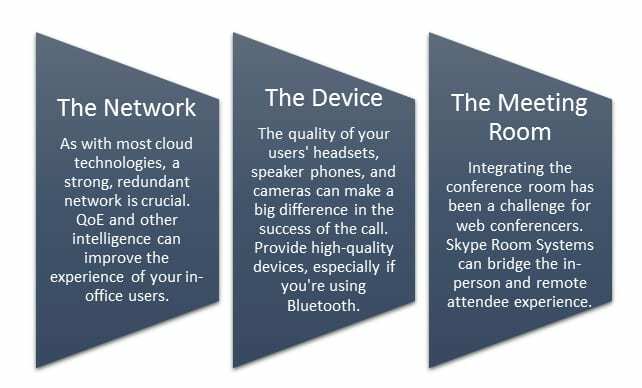 Before we get to that, let’s start with the core web conferencing functions. What do we expect from web conferencing? The goal of web conferencing is to come as close as possible to simulating an in-person meeting. 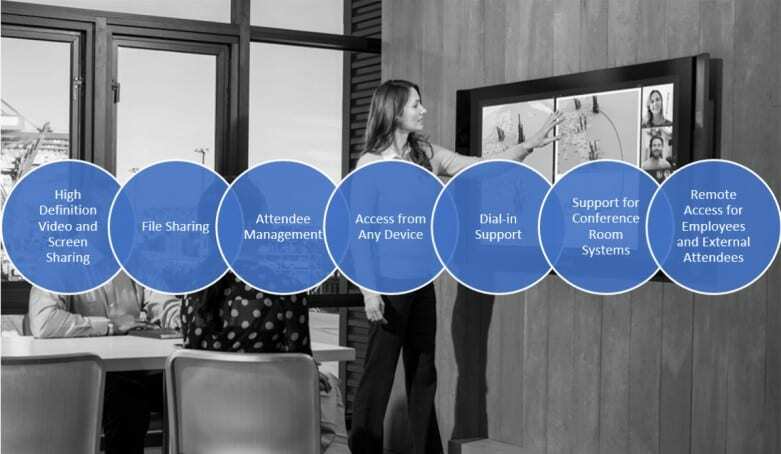 When we think about the collaboration elements that we need to replicate the in-person experience, we expect web conferencing to provide everything but the donuts (rumor has it that Microsoft R&D is working on this right now). So, what are some of those elements? The image below provides a summary. At Peters & Associates, we lean on Microsoft’s Skype for Business for our web conferencing needs. Skype for Business Online with Cloud PBX provides organizations with everything they need for not only the conferencing needs listed above, but also a full phone system. With Microsoft’s reliable cloud offering supporting the bulk of your conferencing needs, what other steps can organizations take to ensure a strong experience? By taking the steps above, organizations can help ensure that their web conferencing experience is as close to the “real thing” as possible. Of course, two of those components, only account for users that are in your facility. Outside of your offices, “The Network” is in the hands of your end users. Provide guidance to your users on the impact of network quality and instructions for turning off certain features (like video) if the user is in a poor reception area. Lastly, training and adoption are crucial to a positive end user experience. Your employees should be familiar with the capabilities and comfortable using them. Leveraging training sessions, quick start guides, and tips & tricks are a great way to educate and reinforce the usage of your web conferencing solution. Hopefully, this guidance can help you to eliminate “Missed Connections” in your organization. If you’re interested in learning more about moving your voice to the cloud, this page can help point you in the right direction. Additionally, you can join us on our webinar at the end of this month as we close out “The Summer of Skype.” As always, reach out to info@peters.com if you have any other questions.